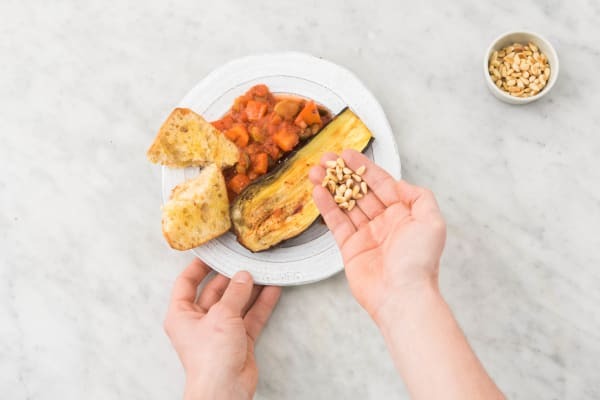 A little bit sweet and a little bit sour, caponata is a famous Sicilian dish made from eggplant, tomatoes, olives, and tangy vinegar. Our version is sweetened up with some roasted red peppers! Preheat the oven to 400°F (to roast the veggies). Start prepping when the oven comes up to temperature! Prep: Wash and dry all produce. Cut the stem off the eggplants, then cut in half lengthwise. Core, then cut the bell pepper into 1/2-inch cubes. Mince or grate the garlic. Thinly slice the olives. 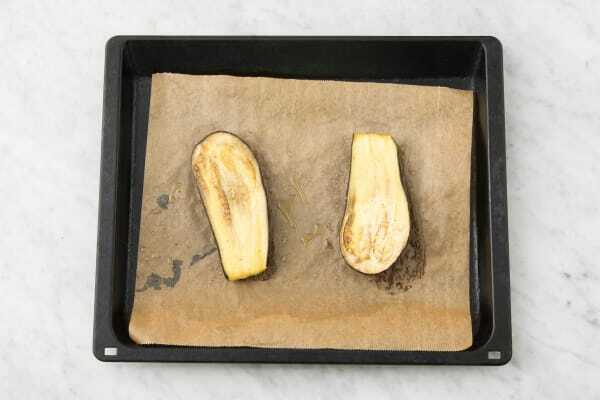 Roast the veggies: Brush the eggplant halves with a drizzle of oil. Season with salt and pepper. 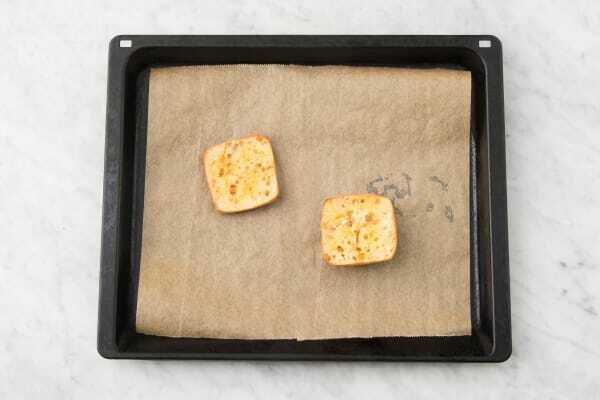 Arrange them cut-side down on a baking sheet. Roast in the centre of the oven, flipping them over halfway through cooking, until golden-brown, 20-22 min. Toss the bell peppers on another baking sheet with a drizzle of oil. Season with salt and pepper. Roast in the centre of the oven until tender, 14-15 min. 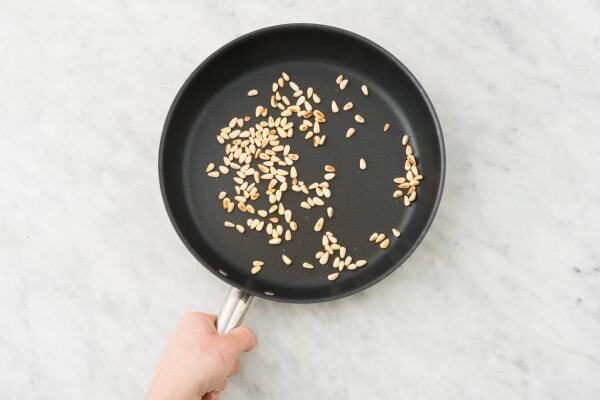 Toast the pine nuts: Meanwhile, heat a large non-stick pan over medium-high heat. Add the pine nuts to the dry pan. Cook, stirring often, until golden-brown and toasted, 3-4 min. (TIP: Keep your eye on them so they don't burn!) Set aside on a plate. 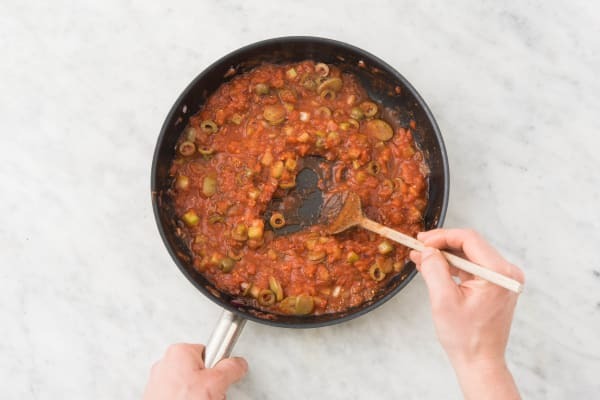 Start the caponata: Add a drizzle of oil to the same pan. Add the onion, celery and half the garlic. Cook, stirring occasionally, until softened, 4-5 min. Add the diced tomatoes, Italian seasoning, olives and 2 tsp vinegar (double for 4 people). Simmer until thickened, 7-8 min. Finish and serve: Meanwhile, stir the bell pepper into the sauce, then nestle in the eggplant. Cook for 2-3 min. Divide the eggplant between plates. 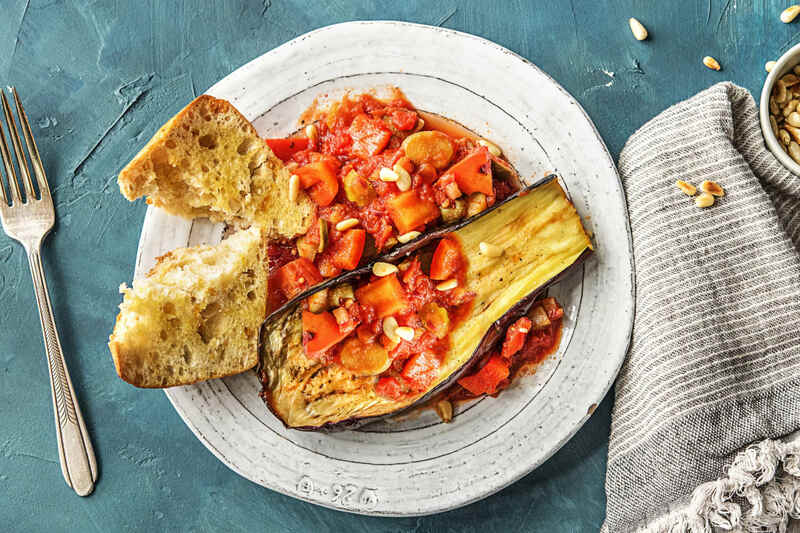 Top with the caponata and sprinkle with the pine nuts. Cut the garlic ciabatta into triangles and serve on the side. Enjoy!